The beauty unchanged in the time of an ancient hamlet. The ideal location to surprise your guests..
Whatever the night of your special day, Valle di Badia will brighten it with its colors and its lights . In Valle di Badia, your special event is perfect like in a movie.. Wedding in the tuscan hamlet. A small tuscan church surrounded by the astonishing nature of a private park. Such a beautiful bride! On the background: the grapes on pergolas of a tuscan hamlet. 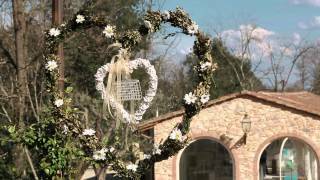 "The Granary" is a perfect place to celebrate a wedding in Tuscany. Wedding In Tuscany at Valle di Badia. View of the tuscan hamlet, Valle di Badia. The Valle di Badia swimming pool is a real jewel in the hamlet’s crown. Made up of several pools at different levels, it lays in absolutely spectacular settings with waterfalls, and choreographed water and light features. Wonderful view of tuscan hamlet under the evening light. The perfect place to celebrate love. At dawn the whole village is reflected in the sinuous #pool while the quiet of the Tuscan countryside still cradles you. If you dream of a special place for your #wedding tale... well you found it! Hosting a wedding at the 17th century Valle di Badia promises to fulfill your every fantasy on this most memorable of occasions. Imagine this: an antique hamlet surrounded by a majestic 50,000 square metres of natural park with a private church, breathtaking apartments, a charming pool and rustic, authentic barns. The antique barns, ‘Sala l Granai’, holds up to 180 people for a sit-down dinner or meeting, and more than 200 people for cocktails. From the hall it is possible to reach the stunning, evocative swimming pool area, in the heart of the hamlet. The large open green areas provide an open-air space for apetisers to be enjoyed. The village offers also 5 different, recently renovated apartments; all enhanced with modern conveniences so that guests can enjoy their stay as much as possible. With the capacity to sleep up to 26 people, they offer a perfect opportunity for you to unwind and luxuriate after your day. Finally, the St. Michael’s Church, with its ornate altar, provides a romantic venue for symbolic weddings and civil rites can be performed at the love pond. That’s about everything you could wish for your big day, what could be better? Would you like to celebrate the happiest day of your life at #VallediBadia?